Chicago has been in a state of unrest since the release of dashboard-camera footage of the fatal police shooting of 17-year-old Laquan McDonald, and on Wednesday morning Mayor Rahm Emanuel tried to calm the situation by apologizing for police misconduct that took place on his watch. Instead, his speech set off the most intense protests since the officer who shot the teen was charged with murder, and led to Chicago lawmakers introducing legislation that would create a procedure to hold a recall election. A judge ordered that the video be released after a journalist sued the city, and many are angry that it took more than a year for the footage to be made public and charges to be brought against Officer Jason Van Dyke. There’s speculation that Emanuel’s recent reelection bid played a role in the decision not to release the video. For the past two weeks there have been ongoing demonstrations over McDonald’s death and other alleged police-brutality incidents in the city. Emanuel responded by firing Chicago police chief Garry McCarthy, and this week U.S. Attorney General Loretta Lynch announced that the Justice Department will investigate the Chicago Police Department. 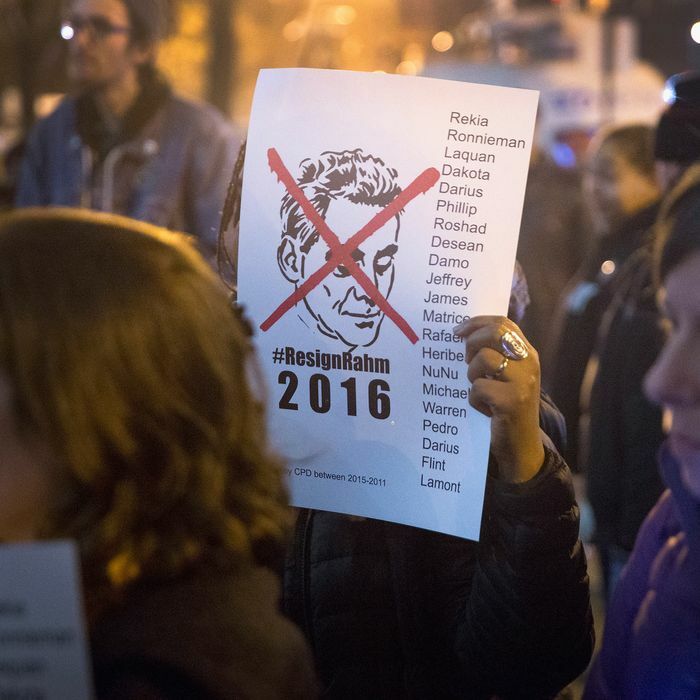 For hours, protesters wove through downtown Chicago, disrupting traffic, waving signs with slogans like “Rahm Emanuel is morally corrupt,” and calling for resignation of the mayor and Cook County state’s attorney Anita Alvarez. In the evening, the demonstrators gathered at Chicago Police Headquarters for a police-board meeting. The Washington Post reports that during the public-comment section about 300 people took turns denouncing the department. Under the plan, a recall election could be initiated with signatures totaling 15 percent of the total votes cast in the last election, in this case 12,500 signatures. Ford drew up the legislation two weeks ago and decided to introduce it after seeing Wednesday’s protests. “The people have lost confidence in the mayor and until he can regain confidence, we have to have something in place that we can try to bring the city together,” he told CBS Chicago. It’s far from certain that the procedure will be put in place. House Speaker Michael Madigan would have to bring up the bill for consideration, the Democratic-majority House and Senate would need to approve it, and it would require the governor’s signature. Emanuel may be able to smooth things over by following through on his police-reform pledge, but if a recall election were held right now, it seems unlikely that he would survive. A recent poll by the online Illinois Observer found the mayor’s job approval is at 18 percent, and his disapproval rating is 67 percent. “Believe me, there’s a lot of buyers’ remorse right about now and there’s a lot of I-told-you-so right about now and there’s a lot of second-guessing,” Chicago political consultant Delmarie Cobb told Reuters. “I do think that if this continues, certainly he would never get re-elected again with 55 percent of the black vote” as he did eight months ago.